Initially influenced by European ammunition pouches, finger-woven bags of the Southeast began to be made with commercially available trade-wool in the early 19th century. The artist has infused this pouch with her own stylistic choices and worldview. 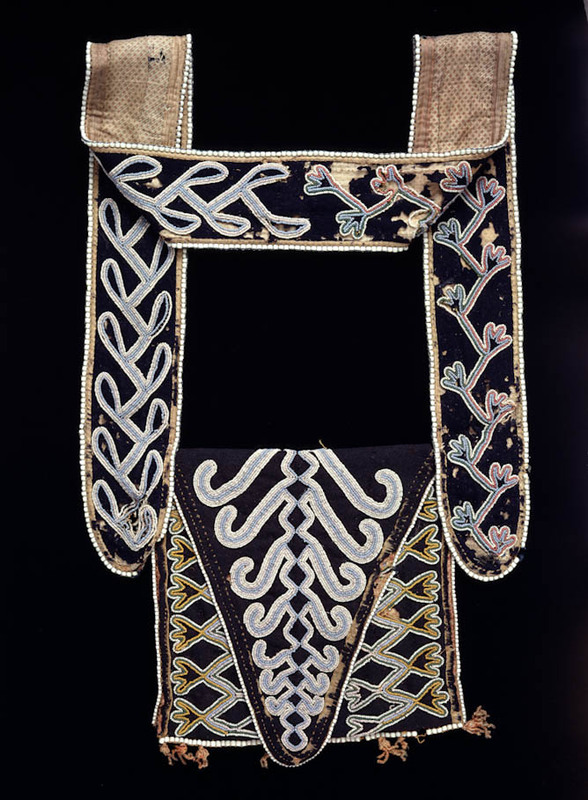 The beaded tendril-like motifs climbing the strap and the triangular flap of this example may represent puffs of smoke symbolic of the Creator. Grimes, John R., Mary Lou Curran and Thomas Haukaas. "Uncommon Legacies." American Indian Art Magazine 28, no. 1 (2002):56-63. Winfield, Coleman. "Uncommon Legacies: The Native American Collection of the Peabody Essex Museum." Tribal Arts magazine, no. 29, (winter 2002):86-97.